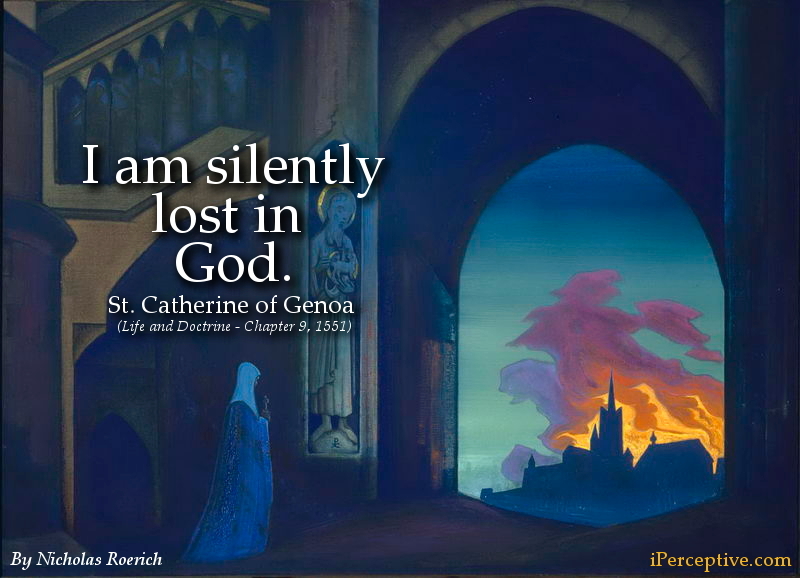 I am mute and lost in God. There is no remedy but God. My I is God, nor is any other self known to me except my God. 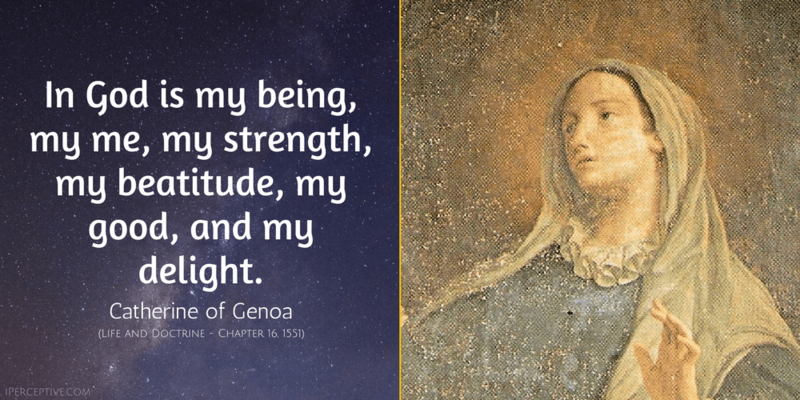 In God is my being, my me, my strength, my beatitude, my good, and my delight. Shall I show thee what God is? No one finds peace apart from him. I find in myself by the grace of God a satisfaction without nourishment, a love without fear. God became man in order to make me God; therefore I want to be changed completely into pure God. Since I began to love, love has never forsaken me. It has ever grown to its own fullness within my innermost heart. I am so submerged in the sweet fire of love that I cannot grasp anything except the whole of love, which melts all the marrow of my soul and body. 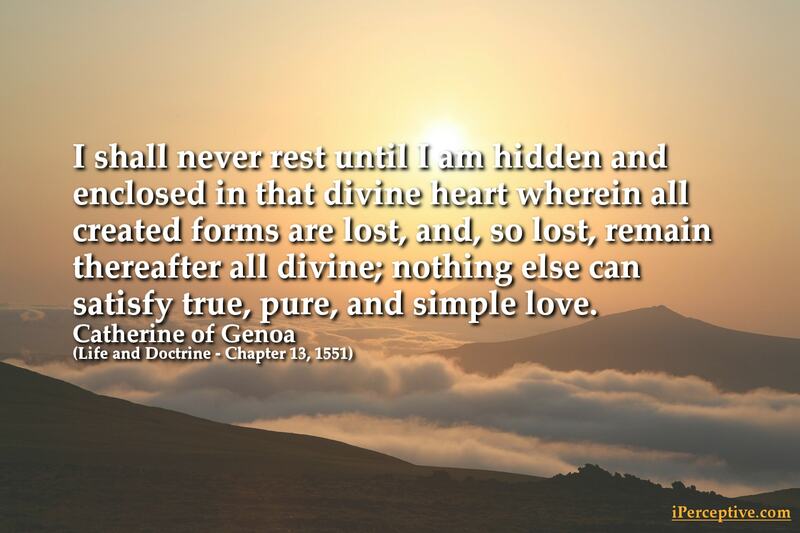 I shall never rest until I am hidden and enclosed in that divine heart wherein all created forms are lost, and, so lost, remain thereafter all divine; nothing else can satisfy true, pure, and simple love. I cannot desire any created love, that is, love which can be felt, enjoyed, or understood. I do not wish love that can pass through the intellect, memory, or will; because pure love passes all these things and transcends them. This I say, because God showed me somewhat of his truth, in order that I might know what man is without him; that is, when the soul is found in mortal sin, at that time, it is so monstrous and horrible to behold, that it is impossible to imagine anything equally so. So long as any one can speak of divine things, enjoy and understand them, remember and desire them, he has not yet arrived in port; yet there are ways and means to guide him thither. But the creature can know nothing but what God gives him to know from day to day. The soul becomes like gold that becomes purer as it is fired, all dross being cast out. Having come to the point of twenty-four carats, gold cannot be purified any further; and this is what happens to the soul in the fire of God’s love therefore I want to be changed completely into pure God. But, for one who desires to approach God, it is necessary to become the enemy of his enemies; and, as I find nothing that is worse than myself, nor that is more inimical to him, I am compelled to hold myself in more aversion than anything else whatever, and will even despise myself and count it to be worthless. It is impossible to describe this love in words or figures which will not, in comparison with the reality, seem entirely false. This only can be understood, namely, that the human intellect is unable to comprehend it. And to him who seeks to know what it is that I know and feel, I can only reply that it transcends all utterance. "O Love, who shall prevent me from loving thee? not only in the world as I am” (meaning the married state), “but even if I should find myself in a camp of soldiers, I could not be prevented from loving thee. If the world, or if the husband could impede love, what would such love be but a thing of feeble virtue and mean capacity? As for me I know by what I have experienced that divine love can be conquered or impeded by nothing. It conquers all things." 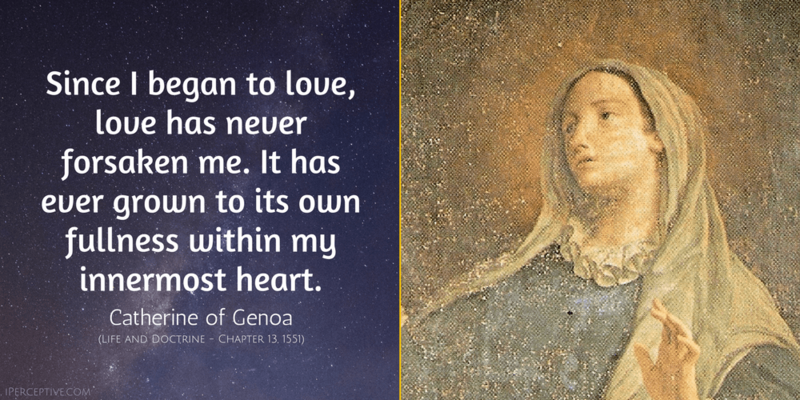 Self-love is so subtle a robber that it commits its thefts, even upon God himself, without fear or shame, employing his goods as if they were its own, and assigning as a reason that it cannot live without them. And this robbery is hidden under so many veils of apparent good that it can hardly be detected except by the penetrating light of true love, which always desires to remain uncovered and bare, both in heaven and earth, because it has nothing shameful to conceal. And when I hear it said that God is good and He will pardon us, and then see that men cease not from evil-doing, oh, how it grieves me! The infinite goodness with which God communicates with us, sinners as we are, should constantly make us love and serve Him better; but we, on the contrary, instead of seeing in his goodness an obligation to please Him, convert it into an excuse for sin which will of a certainty lead in the end to our deeper condemnation. I know for certain that if the soul which truly loves, should behold in herself one thing which separated her from God, her Spouse, her body would be ground into powder. This I know by means of the extreme and unspeakable torments which I suffer from the interior fire which burns within me; and hence, I conclude that love cannot endure even the least opposition, nor will it remain with any one who does not first remove all obstacles and impediments in order to remain with it in peace and perfect quiet. I never wish you to turn your eyes towards anything but love, and there rest, unmoved by any novelty that may present itself, within and without, but be like one dead to all things; because he who trusts in me must never doubt himself. For all the reasoning, cogitations, alternations, and doubts, which man has concerning the spirit, proceed from that very evil root of self, for pure love transcends all human thoughts, and will not live in the soul, still less in the body of man according to their nature, but will do all things above the capacity of that nature, and all that it thinks and speaks is always above nature. When God sees the Soul pure as it was in its origins, He tugs at it with a glance, draws it and binds it to Himself with a fiery love that by itself could annihilate the immortal soul. In so acting, God so transforms the soul in Him that it knows nothing other than God; and He continues to draw it up into His fiery love until He restores it to that pure state from which it first issued. These rays purify and then annihilate. The soul becomes like gold that becomes purer as it is fired, all dross being cast out. Having come to the point of twenty-four carats, gold cannot be purified any further; and this is what happens to the soul in the fire of God’s love. On the other hand, I know not how man can be so blind as not to see that unless God sustains us by his grace, we are full of sorrow, bitterness, wrath, discontent, and woe, even in this present life, where, however, we are never entirely abandoned by him, no matter how great our sins may be. For, if a man could possibly live this mortal life, when entirely forsaken by God (excepting only the divine justice, failing which he would be annihilated,) I am certain that whoever beheld such a being would die. And not only he who beheld him, but he who, though far removed from him, should learn of his existence and comprehend the misery of his state, would also be deprived of life. To be abandoned by God is a thing too terrible and vast for human words to express, or human intellects to comprehend. If man’s eyes were pure, he would see clearly that things which pass away so quickly as do those which in this world are esteemed beautiful, good, and useful, could not truly be said to be so, such words being suitable only for things which have no end. 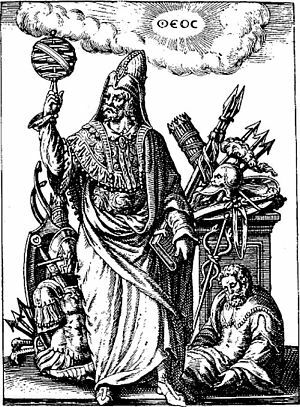 Hence, man, if he prides himself upon temporal things, becomes unable to attain those that are celestial and eternal, degenerates into a vile and humble creature whose greatness is lost and who is degraded to the condition of the things he has always sought. Think, alas, what will become of this spirit so generous, created for the highest dignity and felicity, when it is immersed in the vile filth of its own depraved desires and held by its own demerits in abominations which will ever grow worse, but which will never end and which have no remedy? Alas! what pain, what anguish, and what desperate tears shall then be to this poor soul! This divine love, which thus separates us from the world and from ourselves in order to unite us to God, is our only true and proper love. When, then, it has been thus infused into our hearts, what more can we desire in this world or in the other? Death becomes a thing longed after, and hell loses its terrors for the soul which loves; for it dreads nothing but sin, which alone can separate it from its beloved. Oh, if men, and especially those who love, could only know how great and heavy a thing it is to offend God, they would know it to be the greatest hell that could be suffered: he who has once enjoyed this sweet and gentle love, and lost it through any fault of his, would suffer agonies like those of the condemned souls, and esteem no toils too great by which he might once more regain it. Long experience has taught me that the love of God is our life, our bliss, and our repose, and that self-love is continual weariness, misery, and death both in this world and in the other.